Possibly the biggest splash at this year’s convention was made by API’s new 2448 console. This has the same topology and automation as their smaller 1608 desk with an in-line design. Configurations start at 24 fully featured channels for tracking and 56 channels on mixdown, with an optional bus compressor. 32- and 40-channel frame sizes are also available. This attracted a lot of interest at the show and, as you’d expect, is a beautifully designed piece of kit - although you won’t get much change from $100,000! 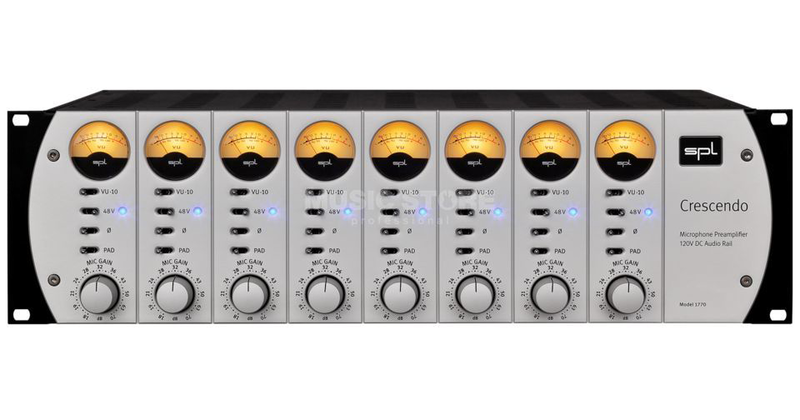 API have also announced a MkII version of their smaller and well established 1608 console. This has been a very successful desk for API with over 600 sold worldwide. The new updated version includes 4 automatable stereo returns, an improved control room section and optional new Final Touch touch-screen automation system. KMR favourites Crane Song have unveiled two new digital products based on Dave Hill’s class-leading Quantum clock. Owners of Neve Genesys and Genesys Black consoles can use this new plugin to control the desk’s analogue EQ and Dynamics hardware directly from their DAW. This neat add-on will allow full automation of the console’s analogue 1084 EQ, 88R EQ and VCA Dynamics. Available from early 2019. 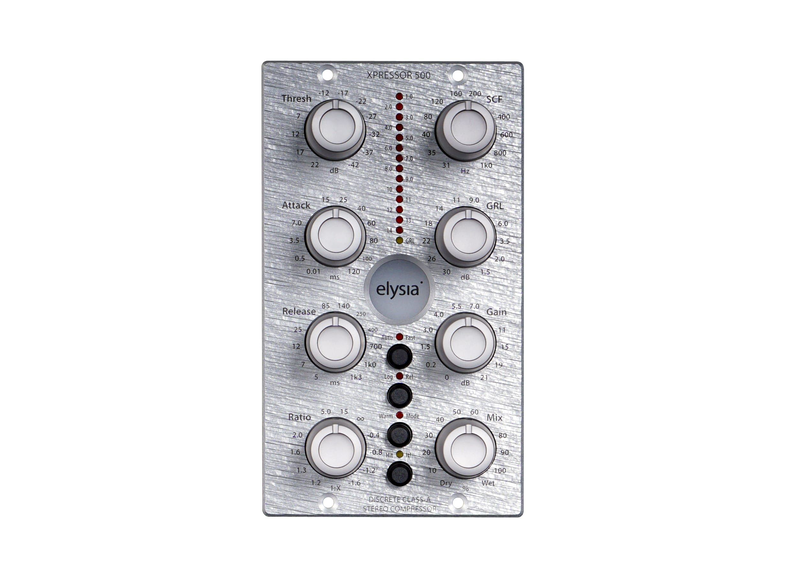 Pultec have announced a mastering version of their EQP-1A - very probably the best Pultec EQ currently available. Progressive-taper Elma Switch stepped controls allow fine control of incremental changes for mastering engineers working on small adjustments, while retaining full range Boost/Atten control for tracking applications. Very nice! 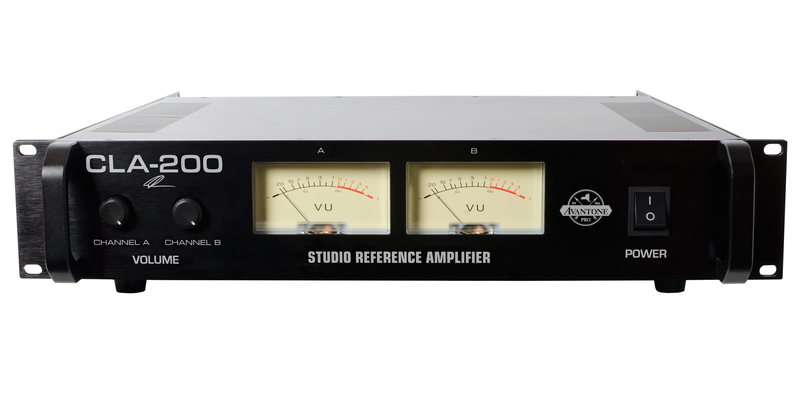 SPL’s new CRESCENDO 8ch microphone preamp uses their proprietary “120V” technology - developed for their Mastering Series outboard. SPL claim exceptional transparency and clarity with the preamps being “nearly impossible to overdrive”. At $6499 this isn’t a budget choice, but anyone familiar with their PQ Equaliser and IRON Compressor will know this is likely to perform very well. 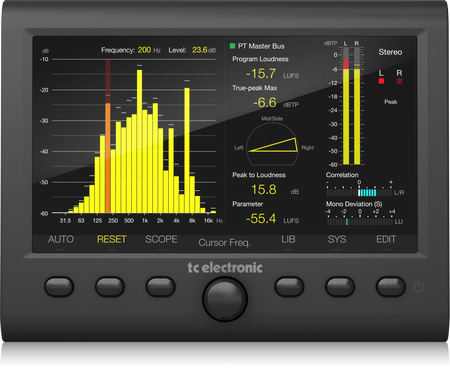 Last year TC Electronic released the TC Clarity M, a desktop 7" inch visual display for stereo and 5.1 mastering and mix monitoring decisions. 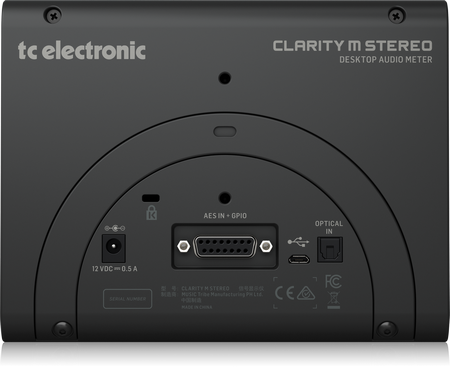 This year they've released the new TC Clarity M Stereo, a dedicated stereo version, at a reduced price point but with many of the original features still in place. There is USB connection for VST, AU and AAX plug-in metering, stereo 96k AES3 digital audio on BNC for broadcast-grade metering. Featuring a Vectorscope, realtime analyser with 1/3 octave resolution, TC's LM6 loudness meter, stereo optical input on TOSlink, and true scalable peak meter identifiers that show you clipping in DAC's, CODECs and downstream filters. Hot on the heels of their 2290-DT controller are the new 8210-DT and 1210-DT mini control surfaces that combined all together with the DVR250-DT will give you the ultimate plugin control surface for that legendary TC sound.
" an on-board NAB/IEC 'Tape Equaliser' facility, re-purposed from historic EMI TG12410 transfer (mastering) consoles and re-engineered for microphone duties "
The Chandler TG Mic has an external power supply rather than relying on Phantom Power to achieve a larger less 'pinched' sound. 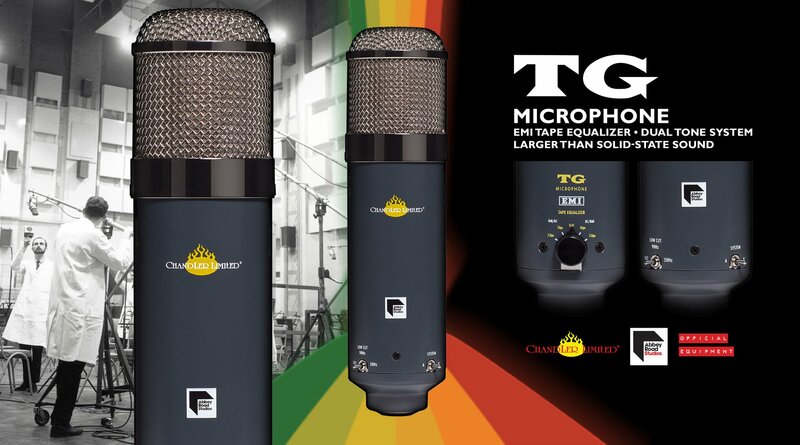 The TG Microphone's EQ settings based upon the EMI NAB/IEC EQ and the Dual Tone System will allow it to be extremely flexible no matter what source is placed in front of it. Rupert Neve Designs have announced their new two channel preamp which is a natural development from their original 5012 Duo Mic Preamp. The new RND 5211 has the added variable Silk which provide saturation on the Class-A output stage. The amplifier circuit design has been improved with higher voltage, providing improved headroom, signal-to-noise and dynamic range. The new RND 5211 also has the custom output transformer from their Shelford Channel and is presented in a single 1u rack. 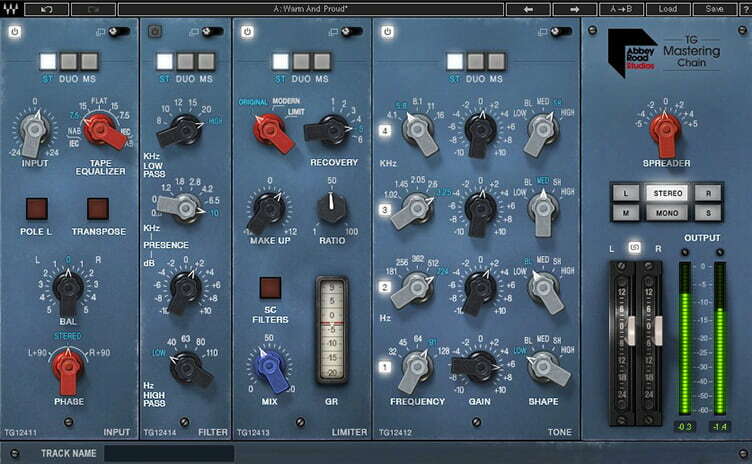 WAVES in conjunction with Abbey Road have released the TG Mastering Chain Plugin bundle. Featuring 5 modules that can be used independently, they are : TG12411 Input Module, TG12412 Tone Module (EQ), TG12413 Compressor/Limiter Module, TG12414 Filter Module and the TG12416 V.A.L (Spread) Module which is incorporated into the output module of the plug-in. With an introductory price point I can see this being very popular! 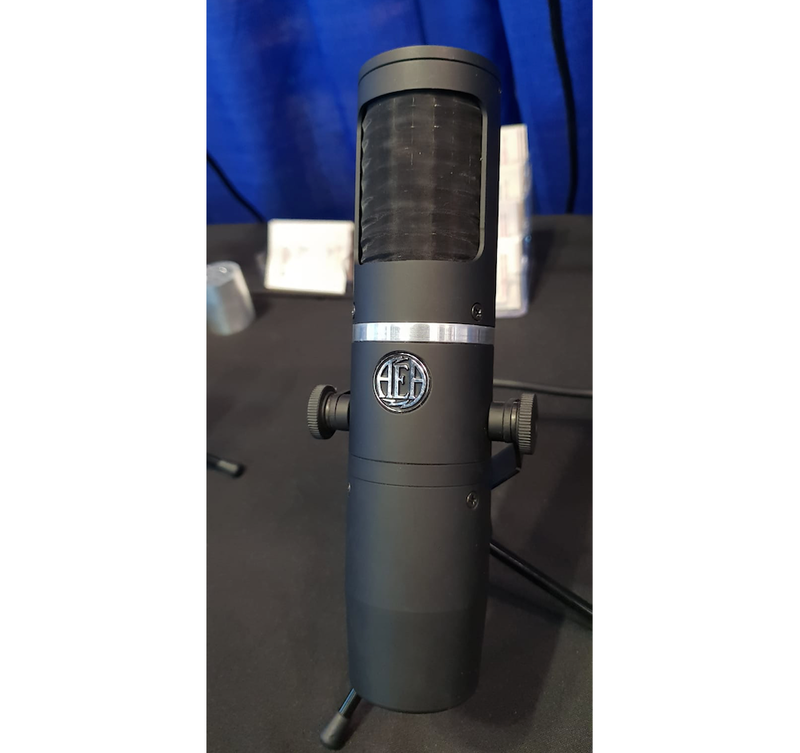 AEA microphones have released the new KU5A Supercardioid Active Ribbon Microphone designed to reject bleed, room reflections and loud ambience noise whilst recording. The KU5A is an Active Ribbon mic meaning you can power it from any mic preamp with phantom power. 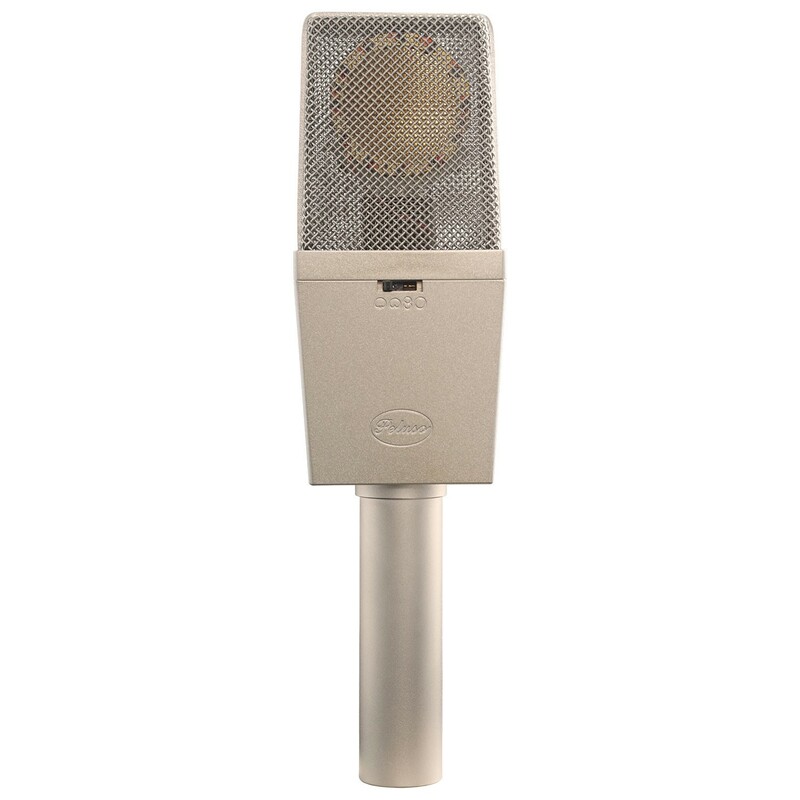 The design of the mic has been tailored for many instruments and voice, with the new grill allowing singers to sing directly into it - which is unheard of really when using ribbon mics. 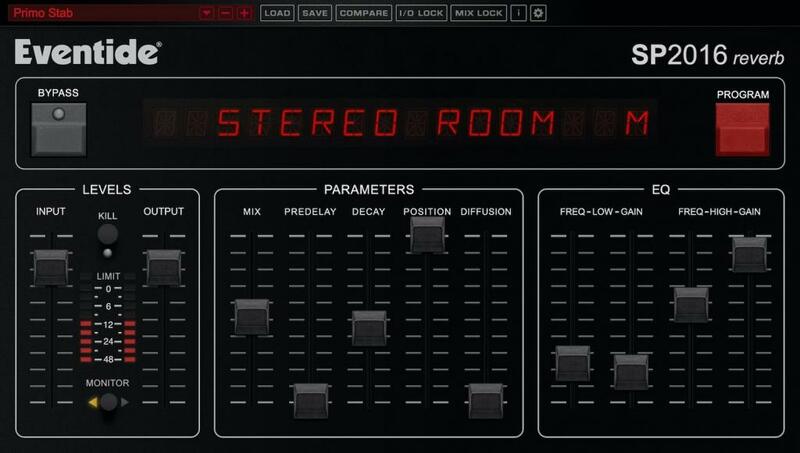 The hardware was a classic, so it's no surprise that Eventide have updated their original Eventide 2016 Stereo Room software reverb to the new SP2016 reverb which is true to the original programming and sound. The SP2016 has been given the thumbs-up by the likes of hardware users Dave Pensado, Joe Chiccarelli and Mick Guzauski. As with all Grace Design products, the sonics, appearance and tactile feel is second to none and will be available from November. 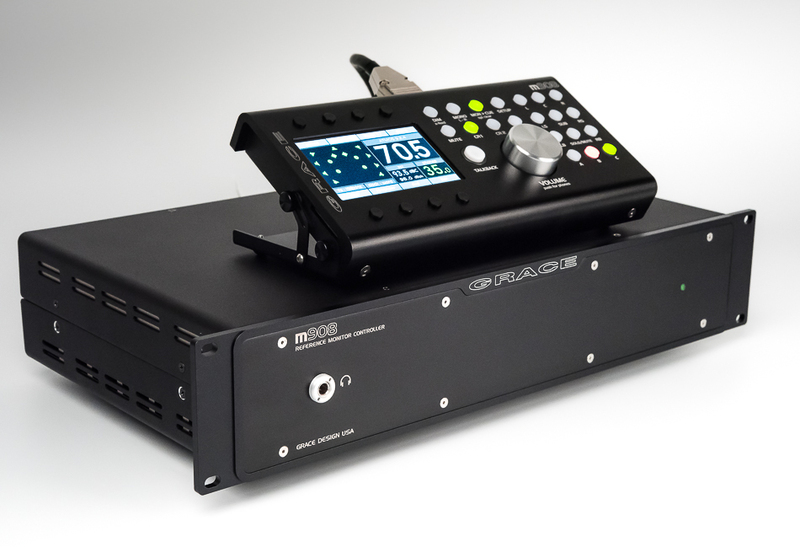 This is the latest Grace Design Surround monitor controller featuring their best AD/DA conversion to date. With up to 24 channels for immersive surround formats such as ATMOS, DTS:X and Auro 3D this provides powerful DSP controlled high resolution volume control. Prism Sound have released their Verifile technology as a software update for their popular audio interfaces the Titan, Atlas and Lyra. 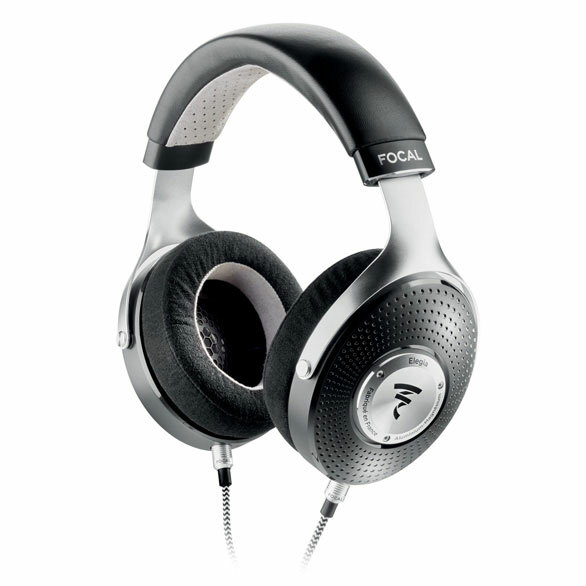 This technology was invented by Prism Sound in 2014 and is now being made available in a firmware release for the above interfaces. This is to help prevent dropouts and other audio errors pass through, within your recording files.
" Verifile encoding is applied to all of the unit's ADCs, and can be checked at all of the unit's DAW outputs. In addition, an offline Verifile Checker app is supplied, for both Mac and Windows, which can check the integrity of recorded files in a variety of formats." 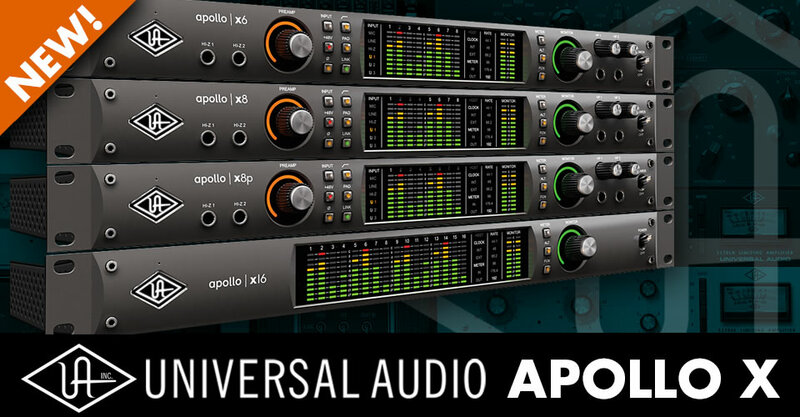 On demo for the first time is Universal Audio's new Apollo X Thunderbolt3 compatible AD/DA converters. 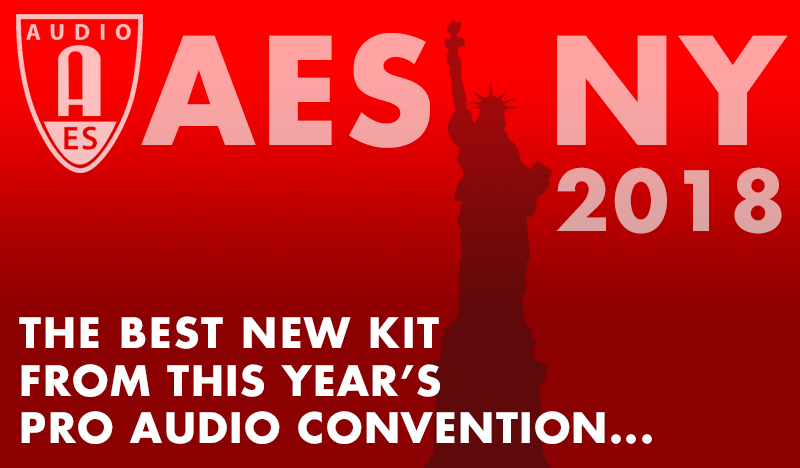 Capable of running up to 50% more UAD plugins with their new UAD Hexa Core processing and available in X16, X8, X8P and X6 versions, this is the new generation of Universal Audio devices for your DAW. One of the most exciting products recently announced is the Solid State Logic FUSION mixbus processor. This is SSL creating a device that will help your workflow, whether in the box or working outside of it. FUSION provides simple mix enhancement tools that have been tried and in various guises throughout the recording industry. Featuring a Drive stage that allows you to add tape/valve style harmonic distortion is followed by Low and High EQ with specifically chosen frequencies to add weight and sparkle. There is a High Frequency compressor for taming sharp EQ peaks - like tape, a Stereo Imager that allows you to add width to the sides without affecting the phase. An insert point can be placed before or after the EQ, and SSL have also designed their own transformer (Yes! a transformer in an SSL) which adds some subtle weight and smoothness to the whole affair. Stock is arriving mid November. SSL have released a brand new reverb processor that is available as part of their Native Plug-in collection or separately as a subscription. It has four reverb types with multiple controls including 6 Band SSL EQ and an output compressor, allowing you to sculpt and control you sounds, even down to a lockable Wet/Dry mix which stays when flicking through comparison settings. Whilst not being announced at AES I couldn't let it pass without a mention of the new Polysynth from Moog Music. The Moog ONE is the first Polysyth from Moog for over 30 years, and they haven't failed to deliver. Available in 16 or 8 voice this is one synth that has the power and sound to inspire.